Patna, March 29, 2010: The unique features of art and crafts in Bihar are the intrinsic beauties and great creativeness. These creative beauties have been preserved in various forms like in ancient stone, wooden structures, grass-clothes, lacquer and metal-wares. These creativenesses have been exhibited in Bihar Utsav at Pragati Maidan in New Delhi. All the stalls of Art and Craft of Bihar in Bihar Utsav have attracted visitors from there works, but Stall No. 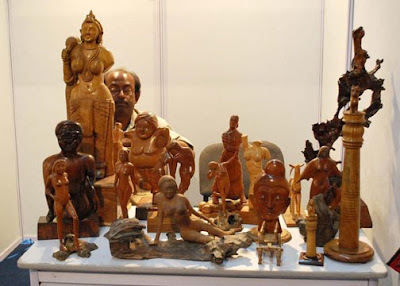 23 of wooden artist Lal Babu Sharma is centre of attraction by its creativeness and display of unique works on woods. There are so many arts of wood craving have been exhibited on this stall like a wood carving of a women who is on bank of river after bath, Jivivsa-a willingness for living, Atikraman- an wooden works to save environment, wall hanging, pen stand, table tops and many more. Lal babu said that kumhar woods is suitable for wooden arts, apart from this he used sagwan, sakhua and other woods for this works. 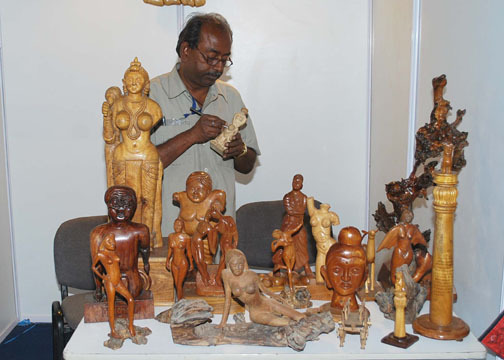 Lal Babu Sharma said wood craving as a form of art and craft was very famous during Mauryan times. During such period wooden houses were made. This ancient art has not only been preserved but also has been converted into a means of livelihood by artists of Bihar which in one of the few places where wood carving work is still practiced. Bihar is one of the few places where the wood carving and inlay work is done with wall plaques, table tops, pens and paper cutters being from wood and inlaid with diverse materials ranging from metal, ivory, stag horn to chips of different wood. Presently Patna is well known for manufacturing of craved doors and windows. Bihar's craftsmen have excelled in manufacturing artistic goods which have great demands in local and international market. The fine skill and perfection of Bihari craftsmen is clearly manifested from various archeological excavations in Kumhrar, Bulandibagh, Nalanda and other places. Pottery, wooden articles, metal wares, stone wares, jewelry, lacquer works, kashida, sikki and moonj wares, wooden and clay toys, zari, artistic textile fabrics and printing on cloth are some of the contemporary crafts of Bihar which are known in Indian as well as international markets for their artistic beauties and innovations. I like the city of on Ganga beach, suitable place to stay in. This is the reason, India is different from other countries. Hi, anyone wants to buy this crafts and rare work.